My wife and I are trying to not only eat a lot of fish, but locally caught fish and other seafood. 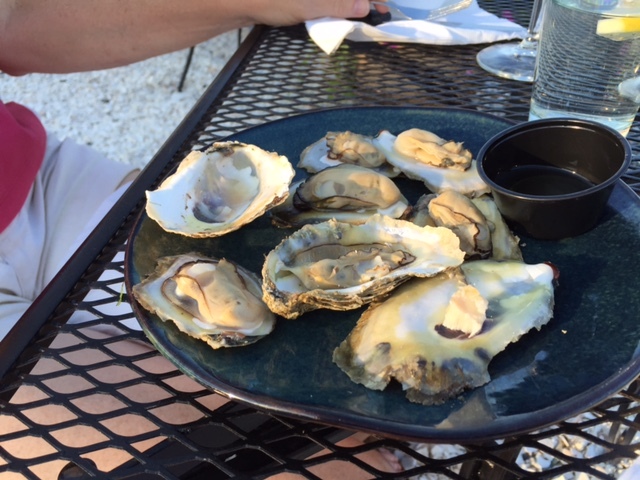 So, in early July we enjoyed a perfect Sunday evening at Merroir, an oyster café in Topping, on the south side of the Rappahannock. The roast oysters were very local, and delicious. We also enjoyed Skate for our main course. Skate (probably Cownose Ray), is fairly common in the Chesapeake Bay in the summer. This one was prepared piccata-style, and it was delicious. Cownose Rays are not considered invasive in the bay. Unfortunately, they enjoy young crabs and oysters, just as we do. Not many restaurants serve them, perhaps because they are a little hard to catch. We recommend you try it if you do see it on the menu. Toward the end of July, we headed to northern California for a wedding. We chose to extend our trip in order to enjoy more of the wine and local seafood. We found wonderful local seafood wherever we went. We had a great lunch at Bouchon in Napa, and then headed over to Jenner for a couple of great meals at River’s End, overlooking the point where the Russian River meets the Pacific. Further up the coast we found Mendocino’s Café Beaujolais charming, with delicious food. Perhaps the nicest surprise was recommended by Blake, the river guide from Catch-a-Canoe who took us up the Big River to look at seals and third growth redwoods along the protected shoreline. Blake suggested we try Wild Fish at Little River. There we enjoyed excellent Halibut and Albacore tuna in a dining room with space for only 20 diners. The biggest surprise was on our last night in San Francisco, when we went to Hog Island Oyster Company on the Embarcadero. In addition to Pacific oysters from five locations along the coast, they had Rappahannock oysters from Topping on the menu. I guess they are popular in San Francisco, since they were sold out that night. 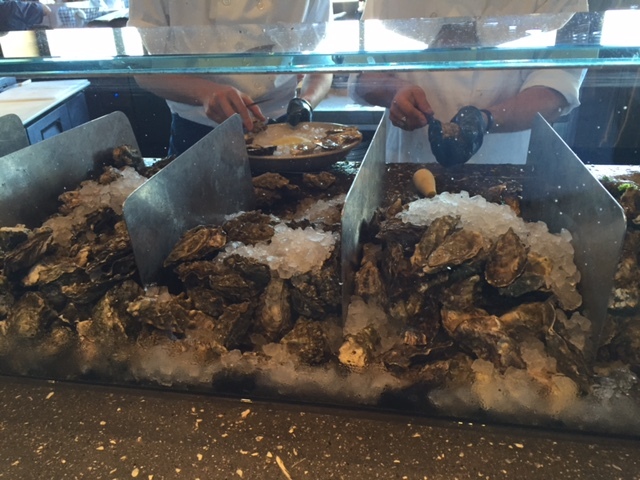 It was exciting to see Chesapeake oysters on the menu of a popular oyster-house in San Francisco. Preparing fresh oysters at Hog Island. This entry was posted in Oysters, Virginia.